Calming, the Finessence Organic Lavender Fine Essential Oil provides a well-being and immediate appeasement. Renowned for its balancing properties and relaxing virtues, it promotes relaxation. This oil, flagship in aromatherapy, is very useful in case of stress and anxiety but also against insomnia and sleep disorders. A real skin care product, lavender offers incredible restorative and regenerative properties. It soothes sunburn and reactive skin. Thanks to its purifying virtues, it is also the happiness of skin with imperfections in fighting against pimples and acne. is always very useful in its kit of care! 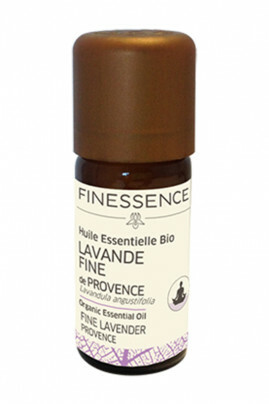 How to use Finessence Organic Lavender Fine Essential Oil ? Air diffusion: Perfume your room with a floral note by adding a few drops of essential oil in your diffuser. For broadcast time and dosage, follow the instructions for use of your device. Cosmetics: Pour 4 drops of essential oil for 1 teaspoon of vegetable oil of your choice. Infusion: For its soothing properties, mix 3 to 4 drops in a liter of lukewarm water. It is important to dilute the organic essential oil on a piece of sugar that you will then add in warm water to unify the mixture. Lavender essential oil has a natural and organic composition! Lavandula augustifolia (lavender) oil, linalool*, limonene*, geraniol*, coumarin*. Contains: linalool, acetate 1-octenn-3-yle, limonene, geraniol. May cause an allergic skin reaction. May be fatal if swallowed and enters airways. Harmful to aquatic life with long lasting effects.